Evolution icon Archaeopteryx turns 150 this year! How are we celebrating? 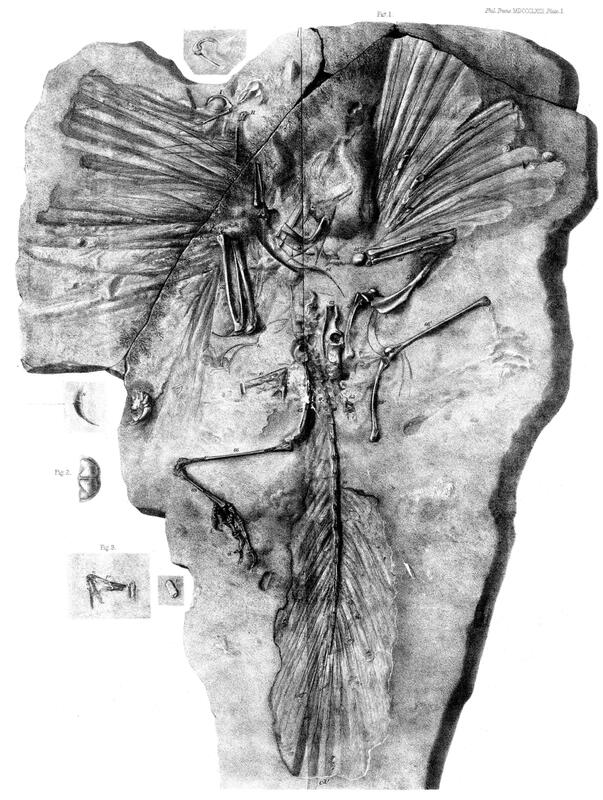 The London specimen of Archaeopteryx lithographica, collected 150 years ago from the Solnhofen Limestone of Bavaria (image from Richard Owen's 1863 description). 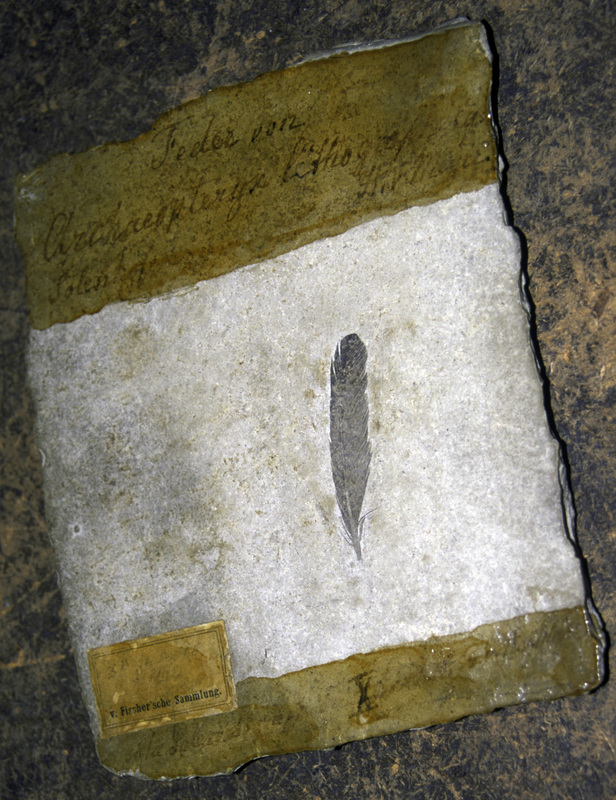 The original, first-discovered feather of Archaeopteryx, discovered 150 years ago in mid-1861 (photo taken by Witmer in Berlin in 1998). It recently dawned on me that 2011 marks the 150th anniversary of the discovery and naming of Archaeopteryx lithographica. In 1861, an isolated feather and a feathered skeleton were discovered in Solnhofen lithographic limestone quarries in Bavaria, southern Germany. Perhaps no other fossils are as important scientifically, historically, and politically as these. The timing was just about perfect for the evolution debates that raged at the time, for here was a remarkable evolutionary intermediate—feathers and wishbone on an otherwise reptilian skeleton—and come to light less than two years after Darwin’s Origin of Species hit bookstores. Since that time, Archaeopteryx has become a political lightning rod in the evolution/creation debates (that sadly still rage), a scientific ruler against which all ideas on avian origins and evolution must be measured, and ultimately an icon, a symbol, sometimes even a logo. Archaeopteryx is famous…and having a birthday! We should celebrate…but how? What’s snood with you? A Thanksgiving turkey surprise. I had no intention of doing another “holiday post” so soon after our Halloween post, but there’s been surprising interest in one of our YouTube videos. Last year we came up with a CT-scan-based animation of a turkey head which showed the blood vessels; we then tagged the end with “Happy Thanksgiving from the Witmer Lab,” and put it up on our YouTube channel. It got a polite response from friends, racking up, ahem, just 266 views. Without giving it much thought, this year on the day before Thanksgiving I posted the YouTube vid to my Facebook wall and to the WitmerLab Facebook page. What a difference a year makes. In the succeeding four days, the video got over 6300 views, a 23-fold increase over the previous 365 days! Happy Halloween from the WitmerLab! 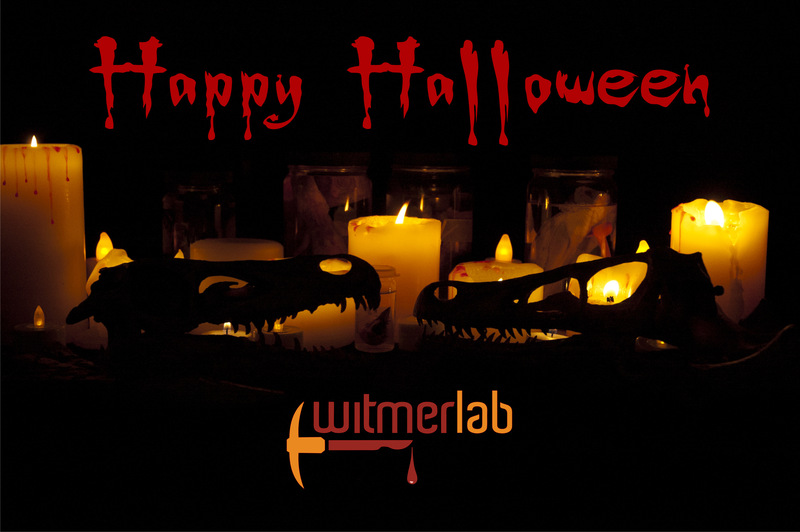 Happy Halloween from the WitmerLab! A pair of Velociraptors face off, as if engaging in some dark ritual. Photography by Amy Martiny. Halloween means something different in Athens, Ohio. Sure, we have kids running around, trick-or-treating in Spiderman, Harry Potter, and princess costumes. But we also have what is reputed to be the third largest block party in the country, involving not just Ohio University students and locals but people from all over. Our little town of about 25,000 residents and 20,000 students swells with another 20,000–50,000 revelers (read the definitive history, Athens News, 31 Oct 2009). Costumes are elaborate and planned months or years in advance. There’s music, there’s food…and, yes, there’s drink. WitmerLab members work extremely hard, but even they are not immune to the pull of this annual event.